The Great Sphinx symbolizes the greatness of Ancient Egypt. As a guardian of the tombs of Valley of the Kings, its meaning is absolute; but its origins are questioned. The Great Sphinx, a testament to the grand scale of Ancient Egyptian culture and art, was one of the first real monumental sculptures in the round (offering a 360-degree view). The monument, which stands at 240 feet long and 66 feet tall, was carved out of a naturally-occurring stone outcropping just northeast of Khafre’s temple in the Valley of the Kings. It stands as a guardian of the Pharaohs in the great necropolis, at the Giza Plateau, in Egypt. A sphinx is a composite figure (a mythological creature composed of parts of different living creatures) that originated in Greek mythology. The Greek version, meaning “strangler”, had the head of a human female, the body of a lion, the wings of a bird, and the tail of a snake. The Greek sphinx was a monster that guarded the dead. The Egyptian sphinx had a lion’s body, but often had the head of a man or a ram (to represent the god Amon). Also a guardian of the dead, the Sphinx came to be common in Egyptian monumental art, usually smaller and positioned in pairs outside tomb entrances. The regal head of the Great Sphinx was carved from the natural harder stone that was already in place. The body of the statue was formed from huge blocks of quarried sandstone that were moved into place. Originally, the great statue was probably faced with painted plaster. 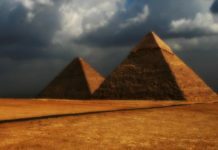 Who Built the Sphinx and When? Many believe the Sphinx was carved over 4,500 years ago by the same workers who constructed Khafre’s pyramid, located just north of the statue. But with no inscriptions on the Sphinx to link construction to Khafre, and an inventory stele showing that his predecessor Kheops built a temple specifically next to the Sphinx, this date has become less reliable. 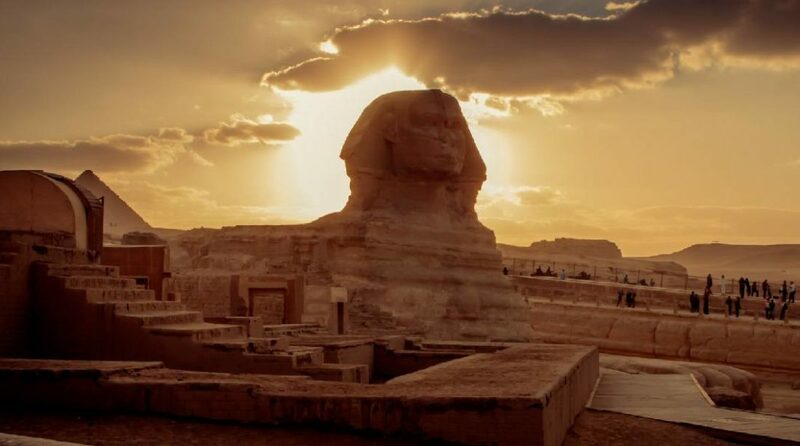 There is evidence that the Sphinx was commissioned by Khufu, who ruled from 2613 – 2498 B.C., or around 4,600 years ago. Another theory places the construction of the Sphinx back even farther than seemingly possible. According to some, the dates and types of certain monuments coincide directly with the astronomical forecast. For example, the Sphinx, having a body of a lion, could have been constructed during the age of the constellation Leo, before 10,000 B.C. This would have been earlier than any known civilizations (including Egypt). It didn’t take long for erosion to begin affecting the Sphinx. The material from which it is carved is soft and highly susceptible to the wind and heat of the Egyptian desert, and even the annual flooding of the Nile. The Sphinx probably began eroding as soon as it was completed. Ironically, it was the wind that probably also aided in the preservation of the Sphinx. The wind, constantly stirring up sand, eventually buried the monument, encasing it for most of its existence. In fact, it was King Thutmose, ruler from 1425 – 1417 B.C., who first began to try to clear away the sand in order to fulfill a prophecy (the Sphinx came to him in a dream, vowing to make him King if he unearthed the statue). Many others had tried to completely exhume the Sphinx from her sandy grave through the millennia, including Napoleon in 1798. It was not until 1936, though, that Frenchman Emile Baraize succeeded in excavating it. The Sphinx exists today in a state of constant erosion. Its nose has been missing for nearly 600 years, and the rock is cracking and crumbling under the Cairo smog, sun, and wind. There are no real excavations taking place on the Sphinx today, only a huge preservation effort to save one of the last remaining symbols of Ancient Egypt.